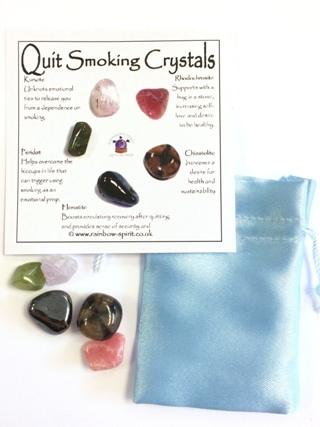 A set of crystals (Kunzite, Rhodochrosite, Peridot, Chiastoite and Hematite), carefully selected to complement each other and to provide support while quitting smoking. The set includes the five stones and a pouch, and comes as a set with information to explain each stone. This is one of our 'stock' items, so the photograph is an example of the set we will put together for you.